Bag of Unicorn Farts: A sugary snack with mythical origins. When you least expect it, magic can come out of unexpected places. 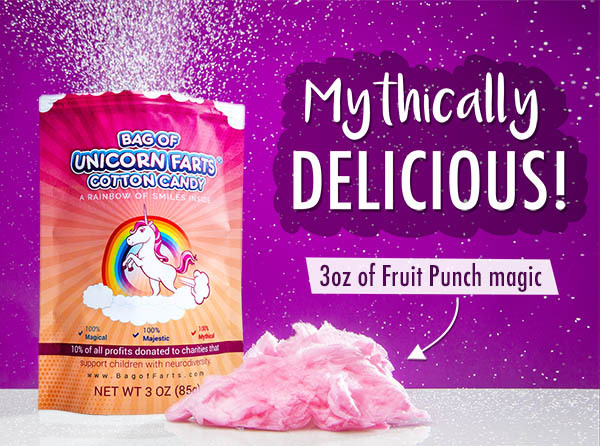 Each Bag of Unicorn Farts is sourced from the world’s most enchanting and gassy unicorns, probably after eating some magic beans. This fantastical flatulence is packaged as a light and fluffy snack that, if you didn’t know its origins, you would swear was cotton candy. In addition to the magical treat inside, the funny packaging and eye-catching name make this gift a real gas. The packaging has changed since this video was made. Unicorns are so legendary that they have magic coming out of their… tails. 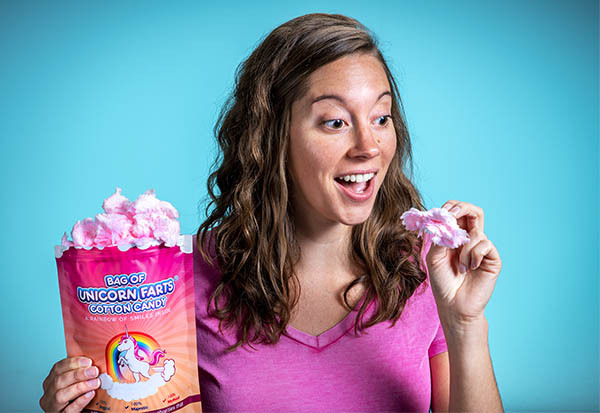 Snack on a Bag of Unicorn Farts and enjoy a fun treat worth making a stink about. This fluffy flatulence stays fresh thanks to a resealable bag that traps in the farts like a car with the windows rolled up. 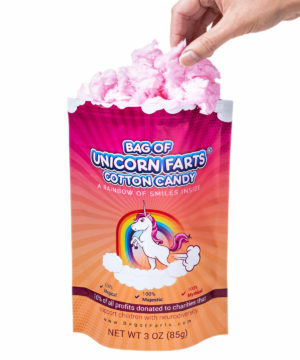 Each Bag of Unicorn Farts is filled with a downright tasty sugary candy. It's a gift that any lucky recipient will find both funny and delicious. Best of all, the manufacturer donates 10% of their profits to charities that support children with neurodiversity, encapsulating a spectrum of cognitive differences including autism and dyslexia. Buying a bag of delicious enchanted farts is a chance to waft magic into your life and help the lives of others as well. The finest in unicorn gastronomy. Question: I can’t find mythical farts on the USDA food pyramid. What’s in this stuff? Answer: Unicorn Farts are harvested from beasts that recently ate sugar, artificial flavoring & colors including Red #40 & Blue #1. Question: How similar is this to cotton candy? Answer: Incredibly similar. That’s what makes unicorns so magical.